Scientists discussing the current situation and future strategy in China for the next-generation high-energy electron positron collider. Image: Yilin Liu. 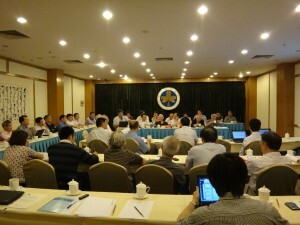 From 12 to 14 June, the 464th Fragrant Hill Science Conference on “The Next-generation High Energy Electron Positron Collider -Current Situation and Future Strategy” was held in the Beijing Fragrant Hill Hotel. Thirty-five front-line scientists from theoretical physics, experimental physics, detectors and accelerators from eleven institutes in China joined the conference. Scientists reviewed the achievements of high-energy-frontier experiments and current research programmes on particle physics both at home and abroad. They also discussed China’s strategy for the next-generation high-energy electron-positron colliders. Jie Gao, Asian Linear Collider Steering Committee chairman and Linear Collider Board member, gave a talk entitled “LC international collaboration status & Higgs factory and its future.” In his talk Gao stressed the importance of China’s participation in the ILC collaboration in addition to China’s home-based programme. In the Fragrant Hill Science Conference, the scientists concluded that the next-generation electron-positron collider, a so-called “Higgs factory,” will be a significant historical opportunity for the development of China’s high-energy physics programme. Activities will be actively organised to advance the discussions and studies on the topic. About the Fragrant Hill Science Conference：Established in 1992 and formally instituted one year later under the auspices of the former State Science and Technology Commission of China and the Chinese Academy of Sciences, the Fragrant Hill Science Conference is the general designation of a small-scale academic workshop series, with the objective of promoting free academic exchanges and discussions, fostering interdisciplinary cooperation and integrated studies in various areas of excellence and exploring new frontiers.